If a tree is known by its fruit, and a good tree bears good fruit (Mt. 7:17; Lk. 6:44), then is not the Mother of Goodness Itself, She who bore the Eternal Beauty, incomparably more excellent than every good, whether in this world or the world above? Therefore, the coeternal and identical Image of goodness, Preeternal, transcending all being, He Who is the preexisting and good Word of the Father, moved by His unutterable love for mankind and compassion for us, put on our image, that He might reclaim for Himself our nature which had been dragged down to uttermost Hades, so as to renew this corrupted nature and raise it to the heights of Heaven. For this purpose, He had to assume a flesh that was both new and ours, that He might refashion us from out of ourselves. Now He finds a Handmaiden perfectly suited to these needs, the supplier of her own unsullied nature, the Ever-Virgin now hymned by us, and whose miraculous Entrance into the Temple, into the Holy of Holies, we now celebrate. God predestined her before the ages for the salvation and reclaiming of our kind. She was chosen, not just from the crowd, but from the ranks of the chosen of all ages, renowned for piety and understanding, and for their God-pleasing words and deeds. The author of evil was jealous of Adam, when he saw him being led from earth to Heaven, from which he was justly cast down. Filled with envy, he pounced upon Adam with a terrible ferocity, and even wished to clothe him with the garb of death. Envy is not only the begetter of hatred, but also of murder, which this truly man-hating serpent brought about in us. For he wanted to be master over the earth-born for the ruin of that which was created in the image and likeness of God. Since he was not bold enough to make a face to face attack, he resorted to cunning and deceit. This truly terrible and malicious plotter pretended to be a friend and useful adviser by assuming the physical form of a serpent, and stealthily took their position. By his God-opposing advice, he instills in man his own death-bearing power, like a venomous poison. It was a deed of perfect justice that our nature, which was voluntarily enslaved and struck down, should again enter the struggle for victory and cast off its voluntary enslavement. Therefore, God deigned to receive our nature from us, hypostatically uniting with it in a marvelous way. But it was impossible to unite that Most High Nature, Whose purity is incomprehensible for human reason, to a sinful nature before it had been purified. Therefore, for the conception and birth of the Bestower of purity, a perfectly spotless and Most Pure Virgin was required. Today we celebrate the memory of those things that contributed, if only once, to the Incarnation. He Who is God by nature, the Co-unoriginate and Coeternal Word and Son of the Transcendent Father, becomes the Son of Man, the Son of the Ever-Virgin. "Jesus Christ the same yesterday and today, and forever" (Heb. 13:8), immutable in His divinity and blameless in His humanity, He alone, as the Prophet Isaiah prophesied, "practiced no iniquity, nor deceit with His lips" (Is. 53: 9). He alone was not brought forth in iniquity, nor was He conceived in sin, in contrast to what the Prophet David says concerning himself and every other man (Ps. 50/51: 5). Even in what He assumes, He is perfectly pure and has no need to be cleansed Himself. But for our sake, He accepted purification, suffering, death and resurrection, that He might transmit them to us. God is born of the spotless and Holy Virgin, or better to say, of the Most Pure and All-Holy Virgin. She is above every fleshly defilement, and even above every impure thought. Her conceiving resulted not from fleshly lust, but by the overshadowing of the Most Holy Spirit. Such desire being utterly alien to Her, it is through prayer and spiritual readiness that She declared to the angel: "Behold the handmaiden of the Lord; be it unto Me according to thy word" (Lk. 1:38), and that She conceived and gave birth. So, in order to render the Virgin worthy of this sublime purpose, God marked this ever-virgin Daughter now praised by us, from before the ages, and from eternity, choosing Her from out of His elect. And how precisely exact is this parallel! Seth was born of Eve, as she herself said, in place of Abel, whom Cain killed through jealousy (Gen. 4:25); and Christ, the Son of the Virgin, was born for us in place of Adam, whom the author of evil also killed through jealousy. But Seth did not resurrect Abel, since he was only a foretype of the resurrection. But our Lord Jesus Christ resurrected Adam, since He is the very Life and the Resurrection of the earth-born, for whose sake the descendents of Seth are granted divine adoption through hope, and are called the children of God. It was because of this hope that they were called sons of God, as is evident from the one who was first called so, the successor in the choice. This was Enos, the son of Seth, who as Moses wrote, first hoped to call on the Name of the Lord (Gen. 4:26). In this manner, the choice of the future Mother of God, beginning with the very sons of Adam and proceeding through all the generations of time, through the Providence of God, passes to the Prophet-king David and the successors of his kingdom and lineage. When the chosen time had come, then from the house and posterity of David, Joachim and Anna are chosen by God. Though they were childless, they were by their virtuous life and good disposition the finest of all those descended from the line of David. And when in prayer they besought God to deliver them from their childlessness, and promised to dedicate their child to God from its infancy. By God Himself, the Mother of God was proclaimed and given to them as a child, so that from such virtuous parents the all-virtuous child would be raised. So in this manner, chastity joined with prayer came to fruition by producing the Mother of virginity, giving birth in the flesh to Him Who was born of God the Father before the ages. Now, when Righteous Joachim and Anna saw that they had been granted their wish, and that the divine promise to them was realized in fact, then they on their part, as true lovers of God, hastened to fulfill their vow given to God as soon as the child had been weaned from milk. They have now led this truly sanctified child of God, now the Mother of God, this Virgin into the Temple of God. And She, being filled with Divine gifts even at such a tender age, she, rather than others, determined what was being done over Her. In Her manner she showed that she was not so much presented into the Temple, but that she Herself entered into the service of God of her own accord, as if she had wings, striving towards this sacred and divine love. She considered it desirable and fitting that she should enter into the Temple and dwell in the Holy of Holies. We, who understand the salvation begun for our sake through the Most Holy Virgin, give her thanks and praise according to our ability. And truly, if the grateful woman (of whom the Gospel tells us), after hearing the saving words of the Lord, blessed and thanked His Mother, raising her voice above the din of the crowd and saying to Christ, "Blessed is the womb that bore Thee, and the paps Thou hast sucked" (Lk. 11:27), then we who have the words of eternal life written out for us, and not only the words, but also the miracles and the Passion, and the raising of our nature from death, and its ascent from earth to Heaven, and the promise of immortal life and unfailing salvation, then how shall we not unceasingly hymn and bless the Mother of the Author of our Salvation and the Giver of Life, celebrating Her conception and birth, and now Her Entry into the Holy of Holies? Now, brethren, let us remove ourselves from earthly to celestial things. Let us change our path from the flesh to the spirit. Let us change our desire from temporal things to those that endure. Let us scorn fleshly delights, which serve as allurements for the soul and soon pass away. Let us desire spiritual gifts, which remain undiminished. Let us turn our reason and our attention from earthly concerns and raise them to the inaccessable places of Heaven, to the Holy of Holies, where the Mother of God now resides. St Gregory here gives the Orthodox understanding of the effects of the sin of Adam and Eve. Their sin caused the corruption of the human race, weakening it, so that we are inclined to sin. Since all sin leads to death, we are therefore “death bearing shoots”. There is not a trace of the Latin idea of so-called “original sin”, which, to them, means that because of the sin of Adam and Eve all people are born ALREADY guilty of sin before God. A baby is not automatically guilty of sin from birth, but there is no doubt that as he grows, he WILL sin. Is there a trace of the so-called “substitutionary atonement” doctrine, so much favored by most non-Orthodox, in St Gregory’s Christology. NO! Jesus Christ did not become incarnate to be slain by His Father, taking on our punishment, but in order to give us life, which He was fully capable of giving. 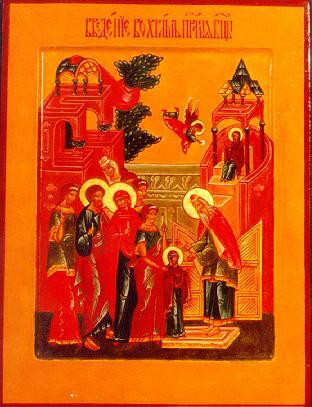 There are foolish so-called “Orthodox theologians” who consider the entrance of the Theotokos into the Temple as a myth which nonetheless communicates holy truths. By this they mean that the event did not actually occur, but that the church uses the story as a sort of parable. These intelligent fools are at odds with St Gregory, and the services of the church, which know that this actual event occurred. How can it be that a man considers himself more intelligent than St Gregory Palamas, and many other holy fathers of the church, and our service texts themselves, which have been chanted with one voice and belief for hundreds of years?